The highlight of the issue is a montage, showing what the gods are up to for a two month period. We briefly touch on all the gods, though some more than others. Gillen and McKelvie interpret this pantheon-wide montage through a spread consisting of eight panel pages. Scenes weave through the pages: sometimes a scene will take up four horizontal panels, sometimes two vertical panels, sometimes four panels in the shape of a square. It took me a second reading to realize that the best way to read the panels is left to right, grouping the panels by color border. It’s a confusing mess of a page layout that’s actually kind of perfect. The stories put up against each other, occasionally contrasting or mirroring motifs and ideas. One of the main stories of the montage is Urdr at Dionysus’s rave, as Urdr, Dionysus, and Woden try to weaponize Dionysus’s raves to act as a calming unifier for the gods. Urdr is a difficult character among difficult characters. She often uses her words as a shield, hiding behind academic jargon in order to criticize anything and anyone. Thankfully, her actions at Dionysus’s rave knock her down a peg and humanize her in the process. This is Urdr completely out of her element, opening up to somebody for the first time and acknowledging the fact that sometimes she can be pretentious for the sake of being pretentious. As someone who really didn’t like the character, showing this different side of her could not have come at a better time, especially since she’s shaping up to be an important player in the next arc. All these intertwining stories intertwine to tell one single message, relayed by Professor David Blake, scholar of the godly Recurrence and someone Urdr knew pre-godhood: all the gods are probably going insane with power and/or worship. This is reinforced by yet another montage, where panels of Blake describing how previous pantheons went insane are juxtaposed with panels of the current pantheon, expertly showing in what direction the pantheon’s insanity is slipping towards. For example, Baal and Minerva stand on a rooftop, backlit by lightning, in a decidedly superhero style panel, showing their determination to fight off the Great Darkness at all costs. In contrast, one panel is a close-up of Persephone and Sakhmet making out, showing how these two goddesses are losing themselves in shameless hedonism. It’s a brilliant example of character building that shows the mental state of all the gods in such a short time. Needless to say, it’ll be very interesting just to see how badly our gods continue to fall and what (if anything) will pull them back from the brink in the first place. 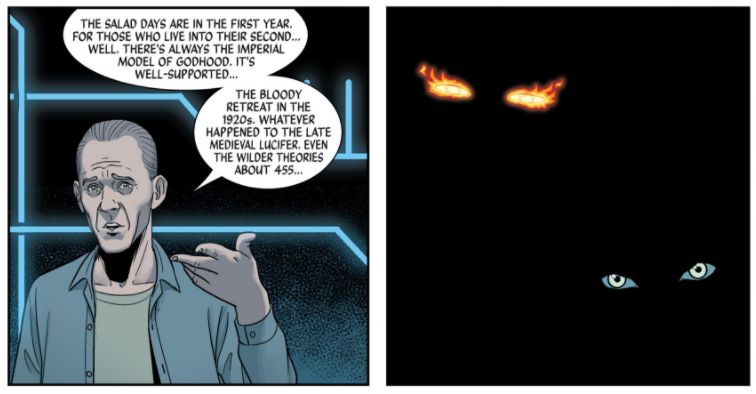 I’m glad Gillen and McKelvie included the scene where Baphomet created his “idea golems” of Persephone’s dead family. 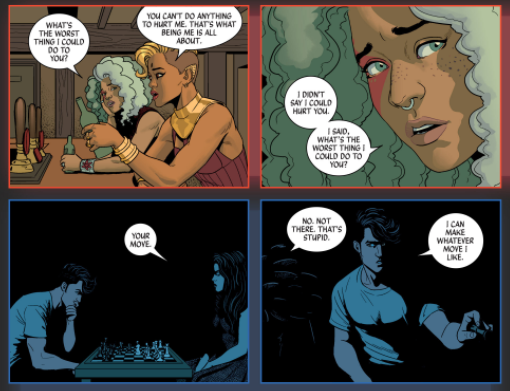 One of the major failings of WicDiv is the treatment of Jenny, Persephone’s sister, who we’re expected to believe had this strong relationship with Persephone despite the fact that she only appeared for one panel with no dialogue. It was wonderful to actually see hints of the relationship between Persephone and her sister, specifically the fact that she really did care for her. It’s refreshing to see David Blake again: easily the best parts of WicDiv are when normal humans react to the idea of godhood, such as Baal’s mother, Beth and her camera crew, Laura pre Persephone, and the interviewers in #23. I hope the wonderful person/people behind the amazing tumblr Everything Wrong With WicDiv enjoyed that cover as much as I did.